1. 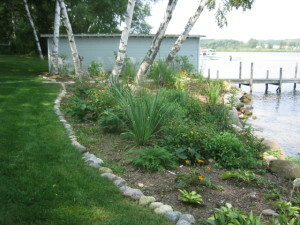 Inform Big Green Lake Property Owners of the best management practices for their respective shorelines. 2. Provide funding/grant assistance for great shoreline projects on a competitive basis. 3. Provide technical guidance to area landscapers while promoting RSVP trained businesses. To-date, RSVP has restored over 80 properties on over 7,000 feet of water frontage. In total, over 135,000 square feet of area has been restored to protective buffers providing much greater protection to the lake from rain events and other runoff events. The GLSD and its partners continue to provide funding/grants for interested property owners. Although the per-parcel savings (i.e. nutrients) may not be as great as agricultural BMPs, RSVP is a valuable member of the overall LMP which provides a comprehensive approach to lake protection and lake improvement. Interested property owners can contact any of the three RSVP partners (GLSD, GLA & DNR) for more information on RSVP. The GLSD’s office number is (920) 295-4488.